Leonardo is sparring with Mike in the sewers when Mikey gets in a shot with his nunchakus that knocks Leo’s bionic hand off of his forearm. The two go back to April’s apartment building and Leonardo complains to Donatello about the hand. The brainy Turtle states that he’ll look at it in a minute – once he’s finished making an exo-skeleton for Dr. X. The brothers stand the robotic body on its feet and Dr. X climbs in and is quickly walking around the room. The Utrom is very happy to be mobile once again. Leonardo asks Don about his hand, and the cycborg explains that they’ll have to use some of his “living” armor to attach the hand permanently. Leo refuses to do this, and presents a metal cap that covers his stump that can produce a sword akin to how a switchblade works. Shadow arrives to tell the guys that April wants to see them and asks to keep Leonardo’s unused bionic hand, which he gives her. Casey is at a local bank trying to cash his ten thousand dollar reward check, but the teller informs him that the bank account that the check is drawn from has been closed, so she can’t give him the money. Jones gets very angry and starts yelling at the woman and she presses the panic button in fear. Casey continues to shout until a security guard clubs him in the head. Back at April’s apartment, April and Splinter have arranged a surprise birthday party for the Turtles. Shadow asks Mike how old he is and the ninja surmises that they’re nineteen years old. The girl asks if it’s also Raph’s birthday, and Michaelangelo states that it is, and then he wonders where his brother might be. Master Splinter says that Raphael hasn’t returned their calls and apparently feels that the Foot Clan is more important than his family. April then hands out some presents and the guys open them – everyone gets a copy of Mike’s first novel, “A Rose Among Thorns”. Mike is overjoyed to see that April managed to get his book published and she explains that Oprah loved it, pretty much guaranteeing that it will be a big hit. The phone rings and April reports that she has to go – Casey has been arrested and she has to bail him out. O’Neil asks her friends to watch Shadow and Donatello says that he’ll keep four eyes on her – and then he uses the armor’s abilities to create a mechanical doppleganger of himself! Don explains that the body doesn’t have a mind of its own, it’s operated via remote control. Shadow is excited and asks to play with the remote and Don hands it over to the girl. Master Splinter suddenly collapses on the floor. Dr. X rushes forward in his new body and discovers that the Turtles’ Sensei has fallen into a deep but fitful sleep. Eventually Splinter awakens and informs everyone that he was dreaming that he and Oroku Saki were fighting together against Raphael and Pimiko… but the memory of the dream is quickly fading. Suddenly, Pimiko arrives and tells our heroes that she and Raphael were battling a new Shredder who Raphael had said fought with Splinter’s skill – and while she managed to escape, Raph was captured! The Turtles doubt her story, but she explains how she and Raph had fought for the right to lead the New York branch of the Foot Clan, but both had lost when the mysterious female Shredder arrived. Pimiko states that she’ll need their help to rescue Raphael (who she owes for sparing her life), and the group heads out. Pimiko leads Don, Mike and Leo along the rooftops until they spy a large group of Foot, lead by the new Shredder, holding Raph hostage and preparing to kill him. 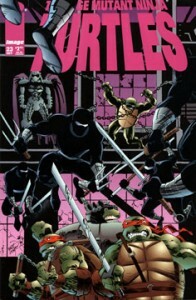 The Turtles attack and Leo faces off against the female Shredder while Don frees Raph. Pimiko takes out some Elite Guards. As Leo fights Shredder, the woman speaks to him as if she knows him, and is surprised when he doesn’t recognize her. The Shredder then strips Leo of his katana, but she was unaware of the blade hidden in his new metallic arm cap, and Leonardo wounds her. Raphael faces Cheng, and while they fight, the healer informs Raph that he stole Master Splinter’s skill in ninjitsu while he was in the Astral Plane. Raph then surmises that Cheng didn’t heal Splinter – he’s actually been draining him of his life force the entire time! Cheng announces that once Splinter is dead, he will inherit all of his knowledge and abilites. Our heroes (now including Pimiko) manage to take out the rest of the Foot and they surround Cheng. The Foot mystic tosses a grenade and Leo scrambles to grab it. Don morphs a cannon arm and Leonardo drops the bomb into the barrel. Donatello fires it into the sky and it explodes – into a massive fireworks display! During the distraction, Cheng makes his escape, as do the other members of the Clan. Raphael wants to give chase, but Leonardo says that their rescue mission has been accomplished and they should let their adversaries go – right now they have something more important to attend to – their birthday party! Mike, Don and Leo run towards home – Mikey calls out that Pimiko can come, too, if she promises not to start any fights. Raph and the female ninja stand on the roof, pondering their next action. Raphael asks the woman what she wants to pursue – family or foes? Pimiko states that she’s done enough fighting in her life and would like to try family for a change. The two head off in pursuit of the other Turtles. Thus ends the Image Comics TMNT series due to diminishing sales. Looking back, I must say that Gary Carlson did a wonderful job melding the Image Comics storytelling style with the Mirage way of doing things. It’s too bad the series had to end prematurely, as I’m sure Gary would have come up with a spectacular ending had he had the chance. Who knows – maybe some day he’ll get that opportunity.